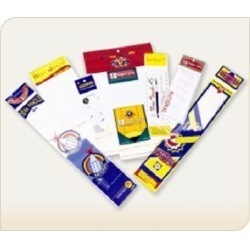 Ours is a renowned firm, engaged in manufacturing, supplying and trading a comprehensive range of Stationery BOPP Bags. Widely used to pack stationery products, these bags are provided to patrons in various sizes, designs and colors at market leading prices. Further, our bags are made using quality-approved BOPP material, which is obtained from the certified vendors of the market. Since the year 2007, we, Nand Polymer, are known in the market as one of the leading manufacturers, traders and suppliers Plain & Printed Bags. From our Delhi, India based unit, we are offering most versatile range of products including BOPP Bags, Printed Bags and Low Density Bags etc. Being as the master of domain, we are bound to implant quality in our products, hence we keep a check of features like durability, texture, resistance, color options, and designs. Similarly, we understands the value of market, hence most of our provided bags are prepared as per the new trends going-on in the market. Our own brands are Star and Diamond. We present ourselves in the market as a dynamic business group that has strong believe in quality & ethics. Owning to a large infrastructure in prime vicinity, we focus on delivering the product range that is completely free from defects & errors. In order to attain this goal, we look for sturdiness, dimensional accuracy and perfect finishing of our products. We as a leader of business acumen, take initiative to provide best manufactured products to our clients in a timely manner.